NOTE: The main address for Cambridge Rindge & Latin School (CLRS) is on Broadway St, but the gymnasium/recreation center is a separate building located at 1640 Cambridge St, which is on the other side of the block. 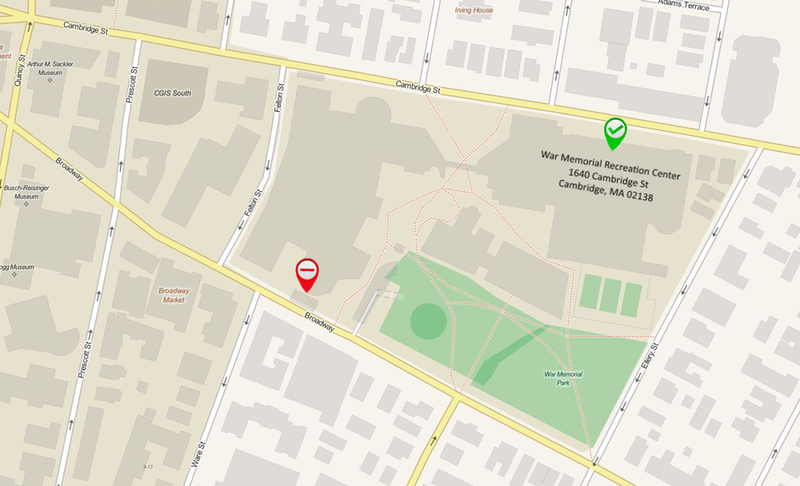 The Boston Beantown Classic Tournament encourages individuals to park at the Harvard Vanguard Parking lot site across the street. Please use the entrance to the parking lot on Roberts Road. Roberts Road is a one way. Therefore from Cambridge Street, turn on to Trowbridge Street and then turn right on Kirkland Street and the next right on Roberts Road. The entrance to the lot is on the left side. Parking is free there. Anybody parking on the street will need to feed the meters on Saturday. NOTE: There is some tree work being done at the entrance on Cambridge Street therefore you would have to go around the block.